I had to look back through previous posts because I couldn’t believe I hadn’t written about what we’ve dubbed as Best. Chicken. Ever! It’s real name is parmesean chicken, but that just doesn’t do it justice. It’s tangy, moist with a crunchy crust and just, yum. If the hubs has been out of town, this is my go-to welcome home meal for him (with coconut bark as dessert, of course). Forgot to take after photos. The smell of it being done is so intoxicating, they don’t last long! Read on! 5 chicken legs, split into thighs and drumsticks. Skin on! Preheat oven to 450 degrees. Line 2 pie plates with foil (my latest discovery to help keep the pans clean). 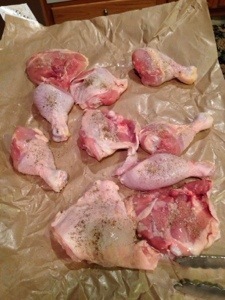 Lay out chicken pieces and sprinkle with the salt and pepper. 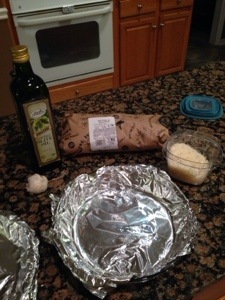 In the pie plates, divide the olive oil, white wine and garlic evenly. Add 1 Tbsp of parmesean to each plate. Take each piece of chicken and toss to coat, ending skin side up. Once all pieces of chicken are in the pans, generously sprinkle the remaining parm on top. 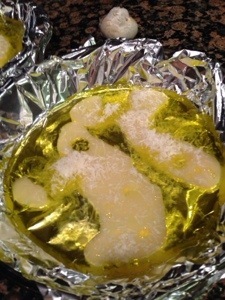 Place in oven for 30 minutes. Turn temp down to 425 degrees for 20 more minutes. Take out and enjoy!